Connect applications and devices to your organization's mainframe. Offers an Eclipse-based environment for building database objects, queries and database logic -- including stored procedures and user-defined functions for Db2, IBM Informix and Oracle databases. Use Data Studio to display performance metrics and identify SQL hot spots, and visualize the impact of database changes. In addition, key performance metrics and correlation metadata can be captured and displayed. Includes InfoSphere Optim Query Tuner, which enables you to capture and visualize potential query hotspots to identify queries that are executed most frequently or take the most time. The tool then provides expert recommendations to help tune queries for optimal performance. Includes InfoSphere Optim pureQuery Runtime, which offers a runtime environment and API that enhances the performance of existing database client applications written in Java, C or .NET. Helps you quickly develop new applications, and optimize database applications and services. Includes InfoSphere Optim Configuration Manager , which provides centralized configuration management for z/OS servers and client applications. Enhances client management efficiency and helps you plan upgrades, meet performance availability objectives and enable faster problem-solving. Enables you to remotely enforce best practice configurations including workload management, Db2 application profiles and location aliases. For large-scale environments, provides features such as mobility on demand, federated database support, server-based monitoring or connection concentrator, and associated load-balancing and failover support. Provides a unified debugger, rapid application deployment with a lightweight runtime client, and other features that allow you to save time and develop applications that work across different Db2 data servers. Includes support for two-phase commit capabilities for multi-vendor data sources. Includes capabilities to save time and improve efficiency such as non-administrator installation on Windows, response file installation enhancements and support for coexistence of multiple copies of the Db2 database system. Autonomic features help to reduce the time required to administer and tune your database system. They include adaptive self-tuning memory allocation and object maintenance policy wizards for Db2 for z/OS. Includes pureQuery technology to help you replace poorly performing SQL with optimized SQL. 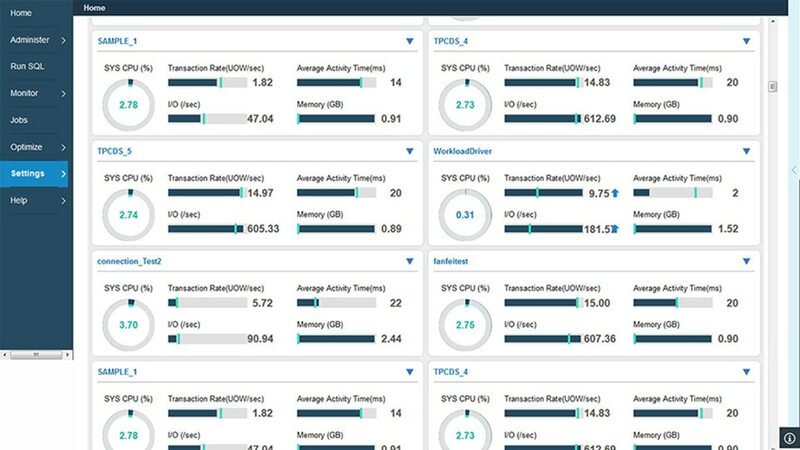 Converting Db2 dynamic SQL to static SQL helps reduce CPU consumption, improve manageability and enforce tighter security. You can use static SQL without making changes to the development environment, and prevent SQL injection by restricting the SQL executed by a specific application to an approved set of SQL statements.